The seniors on the Palos Verdes lacrosse team have never finished a season without winning at least three playoff games. Twice, they have won four, including the 2014 and 2015 LA title games. But they have never won five, losing the Southern Section championship game to Foothill in 2014 and St. Margaret’s last year. Could the Sea Kings, voted No. 1 in the preseason coaches poll, become the first LA team to beat an Orange County squad and win it all? Our Palos Verdes 2016 preview: Coach: Jimmy Borell, sixth season. Last season: 17-6 overall; 5-1 Bay League (tied for first place). 2015 playoffs: No. 1 seed; beat West Ranch in first round; beat Newbury Park in second round; beat Westlake in LA semifinals; beat Crespi in LA championship game; lost to St. Margaret’s in Southern Section title game. 2015 recap: The Sea Kings lost only one game to an LA team last year, 5-4 in overtime to neighborhood rival Peninsula. Their other losses were to San Diego teams (La Costa Canyon and Cathedral Catholic) and Orange County teams (St. Margaret’s twice and Foothill). In all, PV played the third-toughest schedule in the Southern Section, according to LaxPower.com. 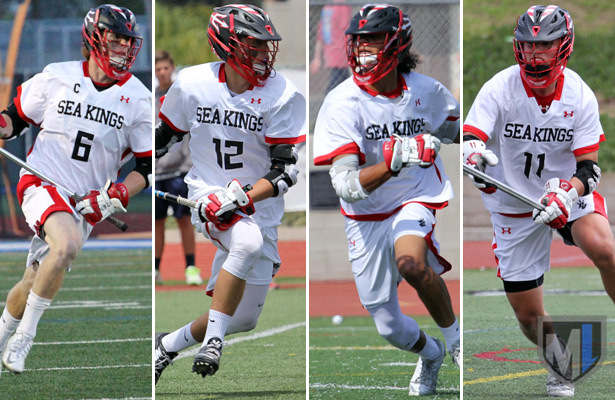 Nevertheless, the Sea Kings shared the Bay League title, reached the US Lacrosse Southern Section North title game for the fourth year in a row, and won that title for the third time in those four trips. But for the second year in a row — and third time in four trips — they came up short against the South champ from Orange County. Senior Mikey Booth, junior Austin Lowi and senior Aidan Westley. Jarrett Jones, senior, LSM/D: Committed to Georgetown; 2015 US Lacrosse All-American; three-time first-team All-Bay League (20 points, 99 ground balls, 60 caused turnovers in 2015). Pete Henkhaus, senior, middie: Committed to Marquette; injured most of last year; first-team All-Bay League as a sophomore. Rizal Smith, senior, attack/middie: Three-time first-team All-Bay League; 35g, 29a as a junior. Shayne Sharp, senior, defender: Committed to Lafayette; 2015 US Lacrosse All-American; first-team All-Bay League in 2015. Aidan Westley, senior, attack: Committed to D-III MIT; first-team All-Bay League; totaled 77 points in 2015. Mikey Booth, senior, middie: Committed to D-III Roanoke; first-team All-Bay League; scored 35 points in 2015. Conner Jongewaard, senior, goalie: Committed to D-III Connecticut College; injured most of 2015. 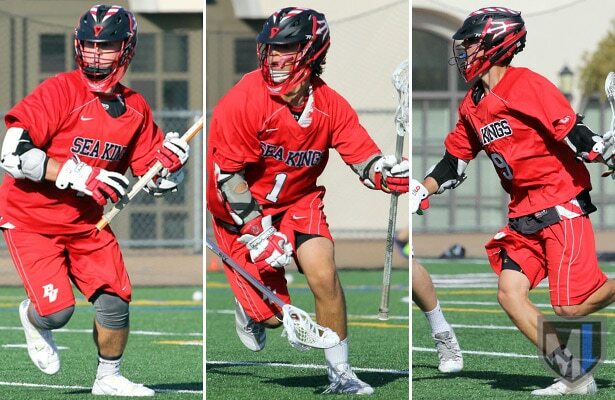 Austin Lowi, junior, attack: Committed to Jacksonville; second-team All-Bay League as a sophomore; scored 46 points. Jack Larkin, junior, attack: Scored 44 points on 63 percent shooting in 2015. Tre Gonzalez, junior, defender: Starting middle linebacker on PV’s CIF runner-up football team; started a couple of lacrosse games last year before injuring his thumb and missing the remainder of the season. John Gressett, junior, middie: Extremely smart and smooth midfielder with a great shot. JJ Barry, sophomore, goalie: Lightning quick hands, extremely athletic. Josh Park, sophomore, LSM: Had 4 points and 21 GBs in 2015 backing up Jarrett Jones. Jake Nolls, sophomore, middie: Starting quarterback on CIF runner-up football team; scored 15 points as a freshman last srping. Beau Sabosky, sophomore, middie: Six-foot-3, rangy midfielder and attackman. Gage Rowland, sophomore, attack: Great crease attackman. Kyle McBride, sophomore, defender: Committed to St. John’s; varsity basketball player; great one-on-one defender and great off the ground. Hart Swan, sophomore, defender: Six-foot-3; big, rangy defender with a great stick, toughness and lax IQ. 2016 Outlook: Two-time All-Americans Stanny Gilbertson (Hobart) and D McCann (Duke) graduated, but the Sea Kings still return an all-star lineup. There are at least two college-committed players at every position except goalie (where there is one). As is fitting for a team with this much talent, Borell once again has stacked PV’s schedule with challenges, starting March 7 at Westlake — a rematch of last year’s semifinal game — and March 11 at St. Margaret’s. Nothing will come easy this year with teams like No. 2 Loyola and No. 3 Westlake, among others, aiming to take the Sea Kings down. But it would not be surprising at all to see PV’s Class of 2016 win another three playoff games … maybe even four … do we hear five?